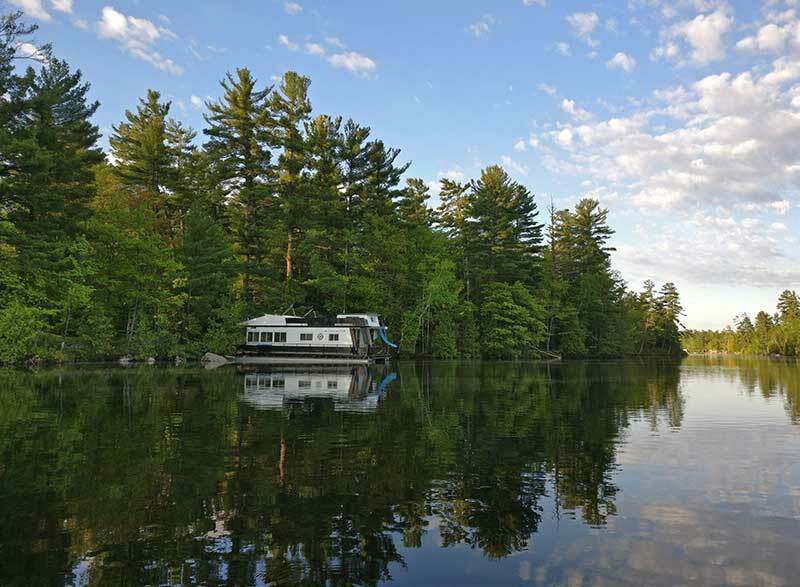 The Kawarthas always sounded like a great place to visit let alone to do it on a houseboat. I haven't been there since I was a kid and in different parts of the region for fishing. You can check out the maps of the area including the lakes and rivers to get an idea of how big the region is, you can watch videos of how beautiful the place is but you can't experience it any other way than in person. 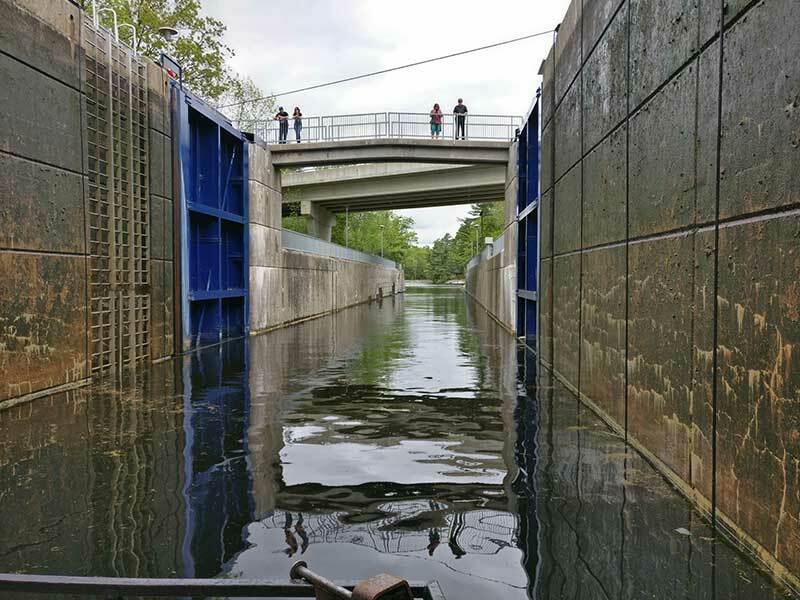 The original plan was to consider going all the way to Peterborough to check out the Peterborough Lift Lock which is a feat of engineering. 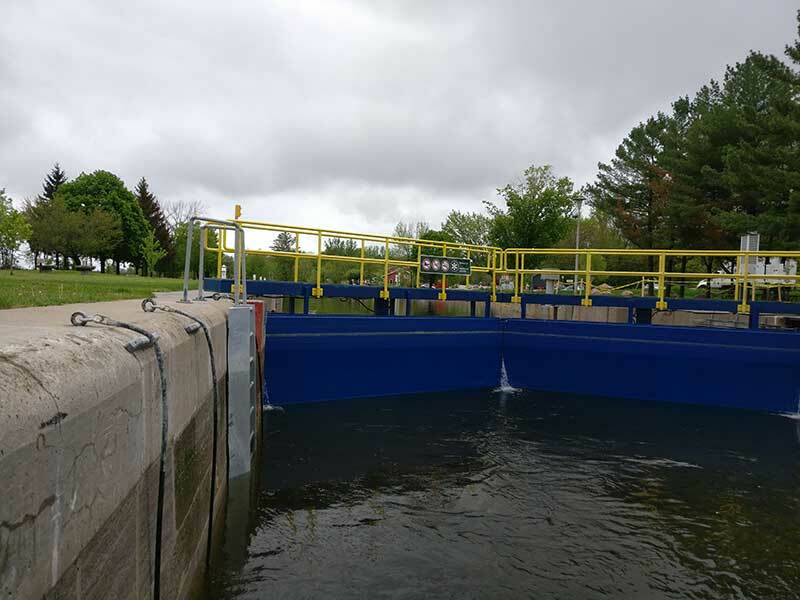 Those plans were changed because the locks were all closed and delayed opening until May 26th due to the high waters. I knew the water levels were high and you could notice that as part of the dock at Happy Days Houseboats was underwater and twisted. 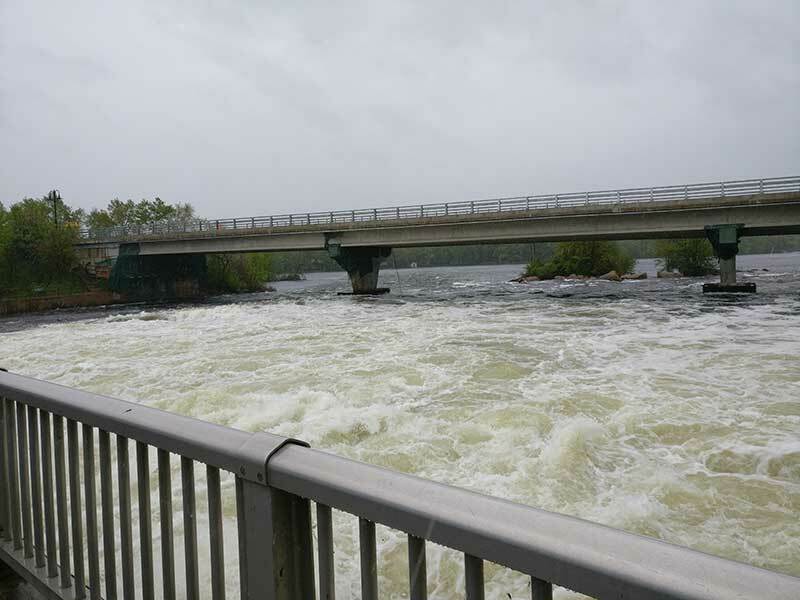 In parts of Bobcaygeon you could see numerous docks on cottages that were under water and the water flowing through all of the waterfalls seemed high and dangerous. The first day was more than just driving to get to Bobcaygeon but it's nice to get unpacked and settled but by the time all of this happened, it was late in the afternoon and we knew the locks were closed until May 26th so we could have gone to other locks or places within Pigeon Lake but it was easier to stay put. 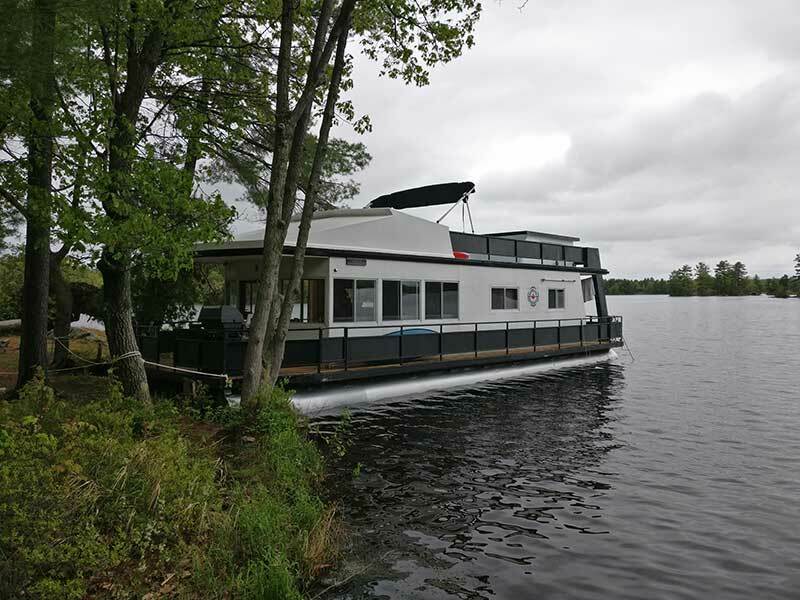 It was also a chance to check out some of the other houseboats that Happy Days has and getting a chance to see their luxury boats was a treat and you'd call this more like glamping than camping. The luxury models had a dishwasher, fireplace, plasma TV, BBQ on the upper deck with quite the place for partying on the top deck. What I didn't know is that you could come the night before you start your trip and spend the night on your boat and be ready to go in the morning, so a lesson learned for next time. 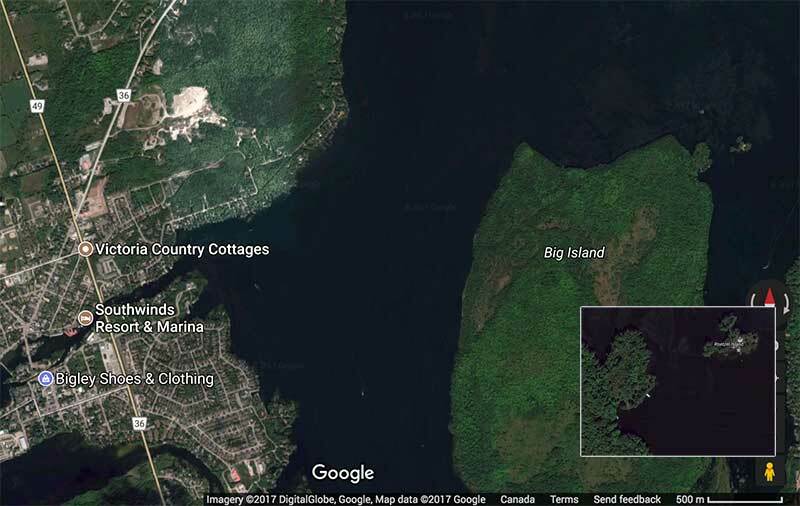 Big Island is really big and surprisingly doesn't feature any cottages or buildings on it. Later on I learned the island had been donated and looks like it will stay that way with the exception of 2 lots. For the moment there seems to be some spots on the north part of the island including the north right part of it where you can moor your houseboat and tie up to a few trees. If you check out Google maps and switch to satellite view, you'll even see a houseboat docked near the spot where I ended up and it's a wonderful spot. Travel time for Happy Days Houseboats to Big Island was just over an hour. Today started off dark and rainy which is ok for fishing but it was a big contrast from the day before which got around 24oC and was hot and sunny. The drive to Buckhorn felt longer as there were strong westerly winds that made going through Buckhorn Lake not as fun as it was a lot of wind, rain and lots of waves. Getting into Buckhorn was nice as it was a remote enough place where you could get electricity at the docks and spend the day there. There is a bait shop, LCBO and a grocery store near this lock so it is a very important place. The dam at Buckhorn was quite the site with a lot of water flowing through. 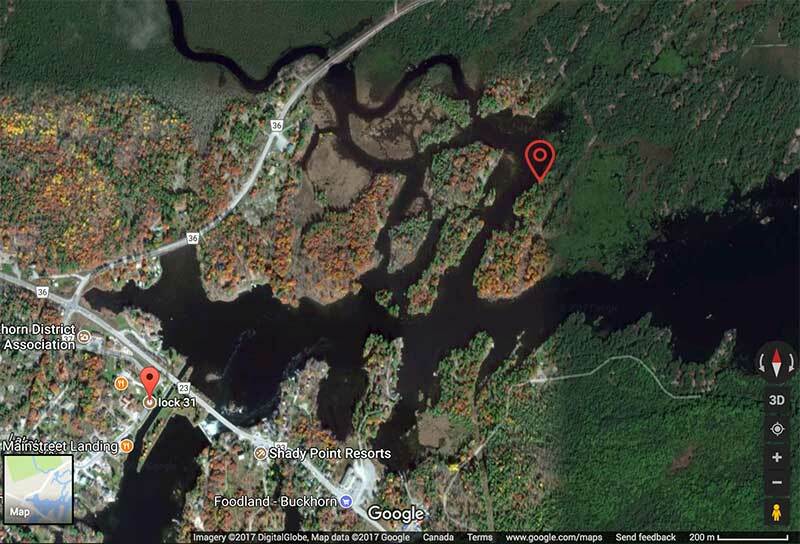 It seems to be a popular fishing spot on either side of the dam and you have Trude's bait shop around the corner. We were the first ones through the lock to start the season and the joy and excitement was short lived as it was over in 5 to 10 minutes. The plan for the day is hope for better weather. One point of interest here is Reach Harbour which is a gas station that takes houseboats as not all gas stations do. If you need gas at any point, definitely consider this place whether you are heading east or west. 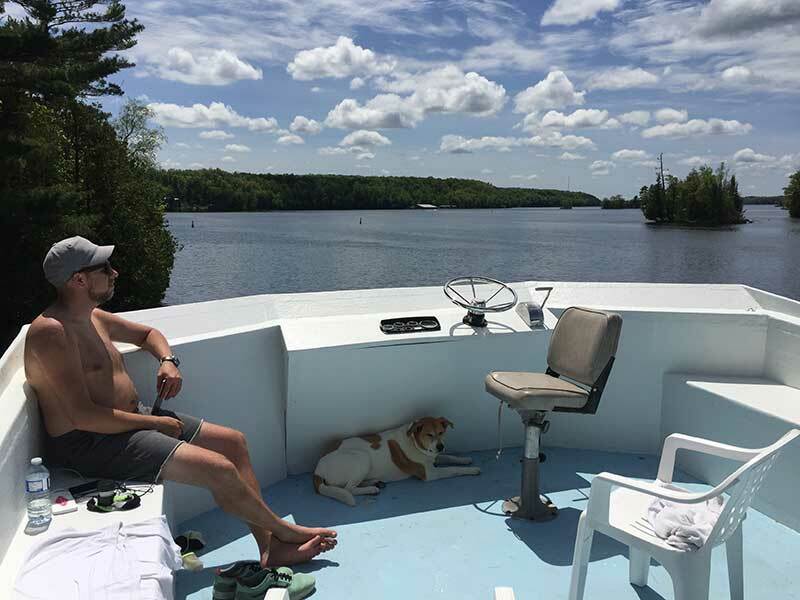 After talking to the Parks Canada people about recommended spots to moor, they suggested just past the Lovesick Lock on Wolf Island as a popular spot for houseboats to moor so we did. It's a nice spot with a few spots to moor and many firepits there from previous campers and glampers. I also refer to this place as mosquito island but it's still worth the visit. 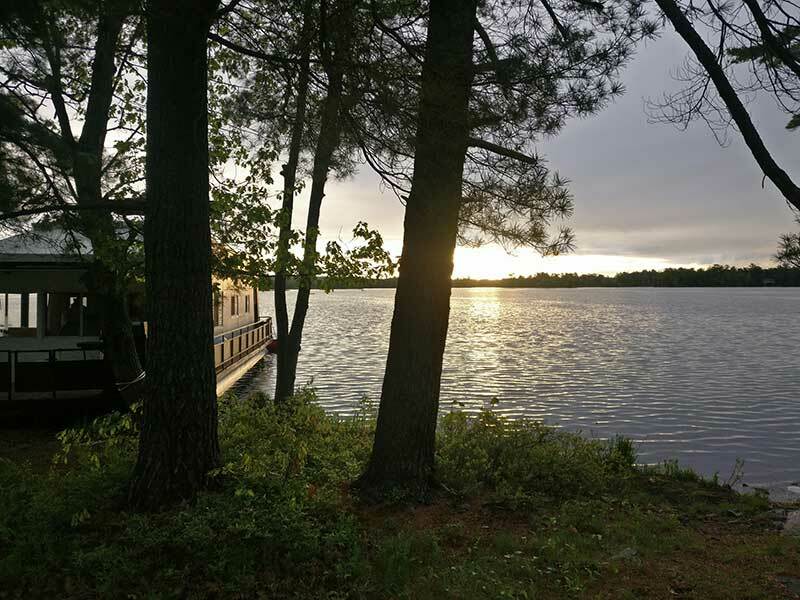 Aside from being a really nice spot to moor, the island is nice and it's a great spot for fishing and if you have a canoe or kayak then you have quite a few nice places to see in this area including a small island that is well known for houseboaters to moor at. The morning started in Wolf Island with a nice sunrise and followed by some canoeing and fishing in the morning. 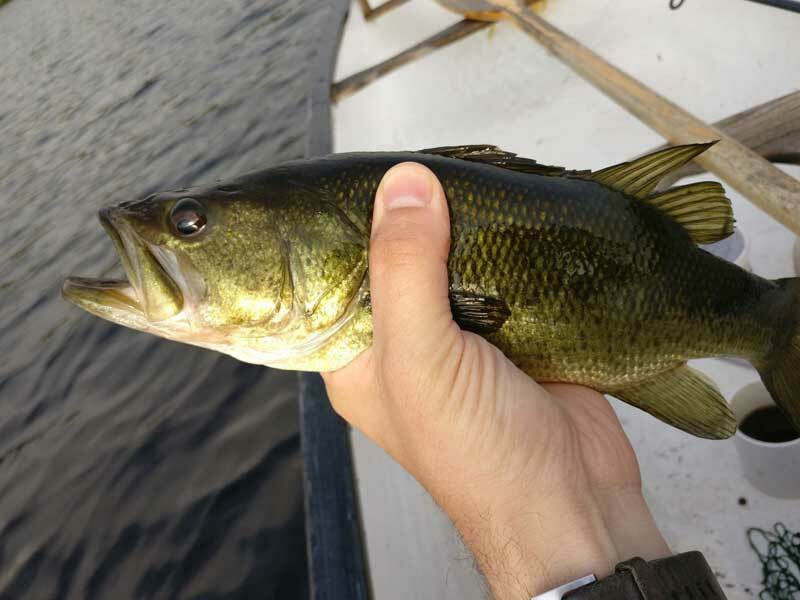 Was no shortage of bass in the area but wasn't able to get any pike or muskie. Burleigh Falls is a place that seems smaller than Buckhorn and there isn't much to do here unless you want to fish. In talking to the Parks Canada staff here, it seems that Stoney Lake is a very nice area but not really an ideal one for houseboaters to find a place to moor as everything here seems to be privately owned. It is certainly one of the nicer areas especially in terms of the cottages that are here but after seeing a few islands decided to head back to Burleigh Falls for the afternoon and stay at the lock. Lovesick Lock is a nice place to spend the night. There are a few park benches and you can walk over a few of the dams and get to see some of Wolf Island as there are some trails that you can access. The Lovesick Lock is only really accessible by foot or by boat so the park rangers have to take a boat to get to work. There is great fishing all around the area and on the side of Lower Buckhorn lake along Wolf Island there are numerous spots for docking a houseboat although the size of the Happy Days Houseboats might be too big for it as the maps show depths of around 4 feet so we didn't want to take any risks. This was certainly a nice spot to spend most of the day and of course it helps with sunny weather. Today got to be around 23 or 24oC however it felt much hotter being on the top deck of the houseboat. MIssissauga River is not an easy place to spot but after talking with Parks Canada staff and the nice friendly folds at Reach Harbour marina, we learned of a popular spot for houseboats which happens to be very close to the Buckhorn lock. Mississauga River has 2 ways to get in and for a houseboat there is really only one spot you want to try going in which is away from the Buckhorn lock. If you are leaving Buckhorn lock then you'll find this inlet on your lefthand side and as you go up the river you'll find a few spots on the right where some have signs that say private property and to keep off. As you go up a bit further you'll want to not go too far and the river will bend to the left. On the right hand side there is a spot where you can see that people have camped here before and until you see a sign that says private or to keep off, we are assuming this was ok to be on. The map shows the approximate location of where I stayed and it was a great spot. The spot is great for canoeing and supposedly great for fishing although the only thing I caught here was a tiny bass that wasn't worth taking a picture of. Today's plan is all based on the weather and rather than heading to Big Island for another night as it was a nice area, there are severe thunderstorms and wind along the way so the plan of action is to leave Mississauga River, pass through Buckhorn lock and make the long trek to Bobcaygeon which is a bit over 3 hours. Sure enough we left somewhat early in the morning and tried to avoid the storms and got partially caught in them. Pigeon Lake was rough boating so Big Island was completely out of the question with the possibility of doing it tomorrow. 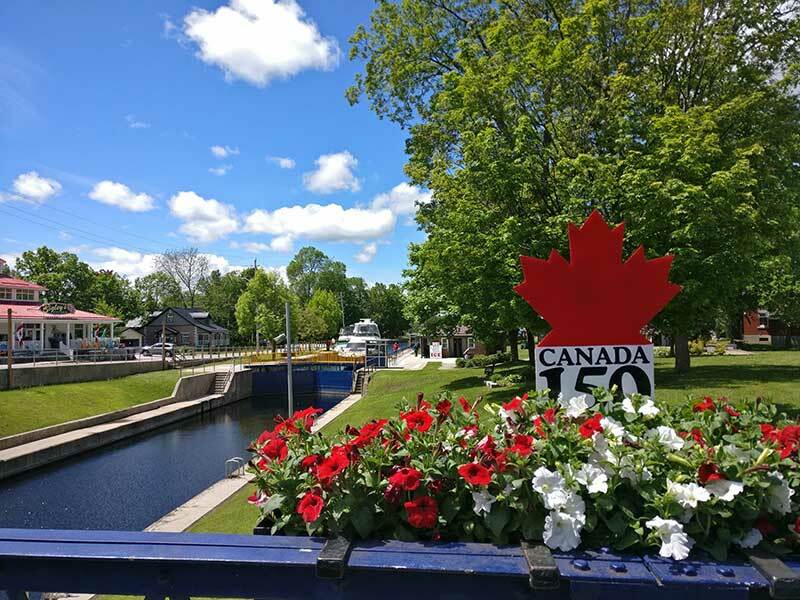 Since the water levels are higher, we were told when passing the current getting into the lock at Bobcaygeon to drive fast to get past the stronger current and then slow it down in the lock. Today had a mix of some sun but a lot of heavy rain with thunder and lightning. 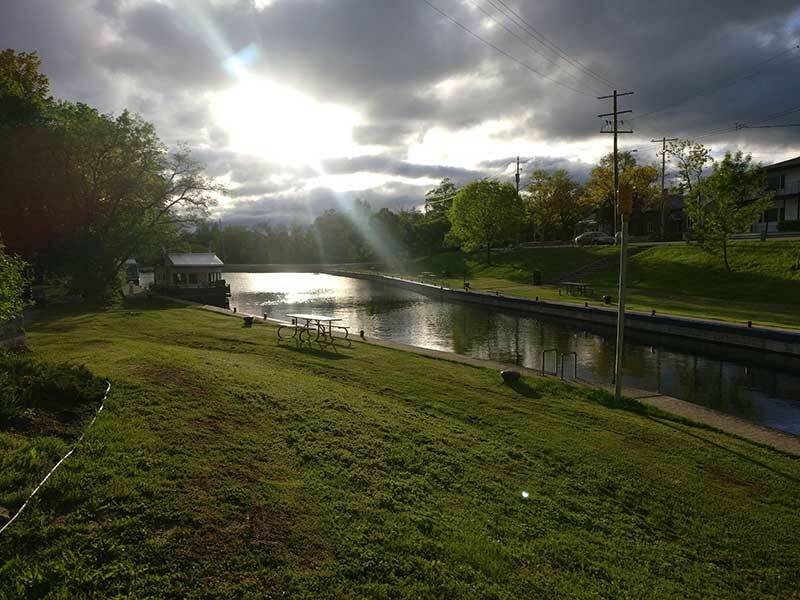 The storm gave us a chance to check out the small town of Bobcaygeon and it's actually a nice town. You can get the sense that in the high season this place gets a little crazy with more people coming into cottage country or boating. 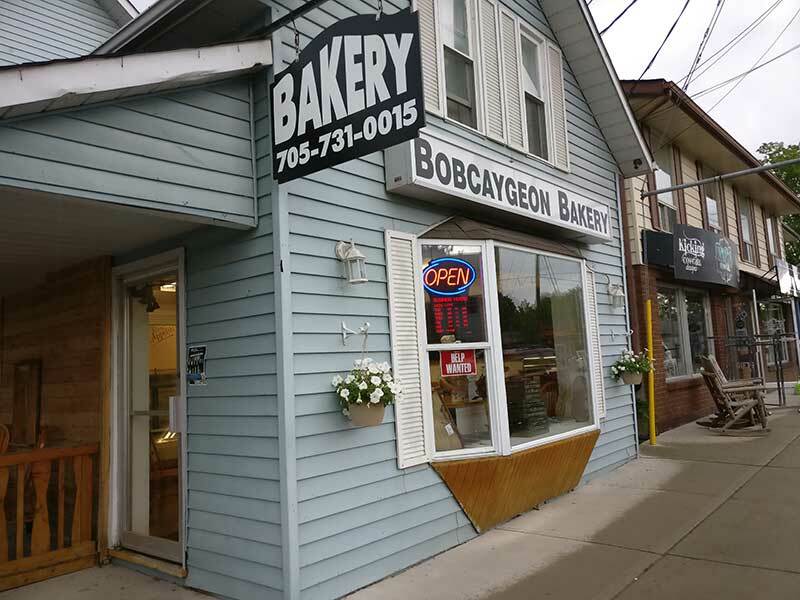 Also Bobcaygeon has quite a few restaurants, Tim Horton's, LCBO and the evil Bobcaygeon Bakery which makes the best cookies, brownies, pies and bread. The weather to start the day was nice but the forecast is showing strong winds and even more storms with maybe a few breaks of sun in the day. 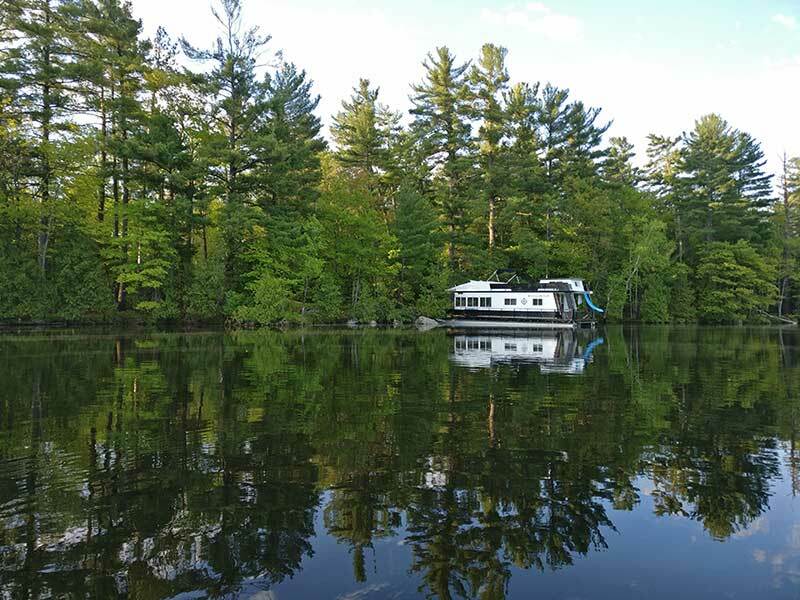 It seems the weather could be windy overnight so the plan is to skip Big Island and save it for another trip and stay put in Bobcaygeon for another day, which really wasn't that bad at all as it's a nice place to be and the fishing in the area is really good. It was also a chance to get any last minute items from Bobcaygeon Bakery. Leaving Bobcaygeon this morning and of course have to make a stop a Tim Horton's which was way too busy and felt like the whole town was there. 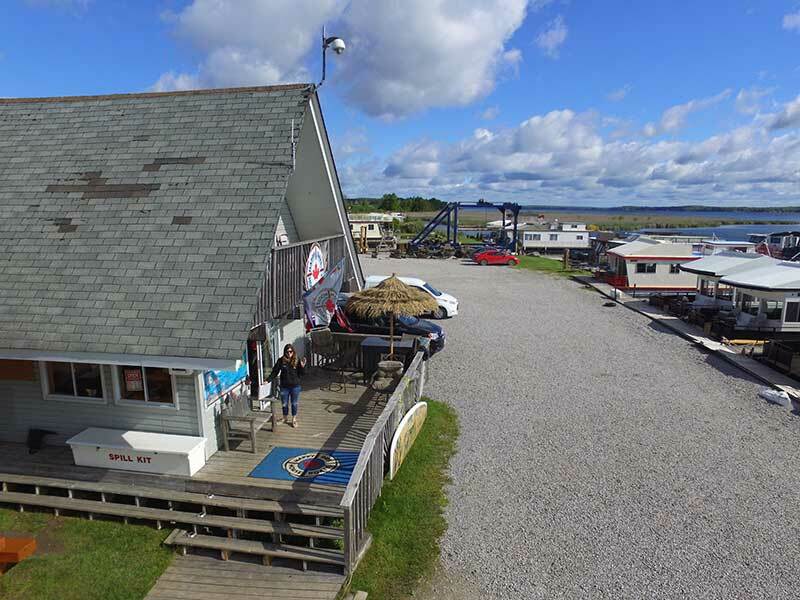 Also another stop at Bobcaygeon Bakery and take the short drive of about 45 mins or so to get back to the headquarters at Happy Days Houseboats. The last night was spent at Happy Days so it makes it easier to get on the road in the morning and it's a nice place to hang out with the owners Jill & Frank plus there were other groups already on their houseboats and spending the night so it had a bit of a party atmosphere already. Overall the offseason was nice but of course the high season is what almost every chases after. That said what's nice about these trips in the offseason is you have less boaters to deal with, you're almost always guaranteed at spot at a lock or a good place to moor. The water was still warm enough to swim in and the spring can be great for fishing and I've heard the fall is another great time of the year to take a trip as you get the fall colours, have great fishing and have all the lakes to yourself. 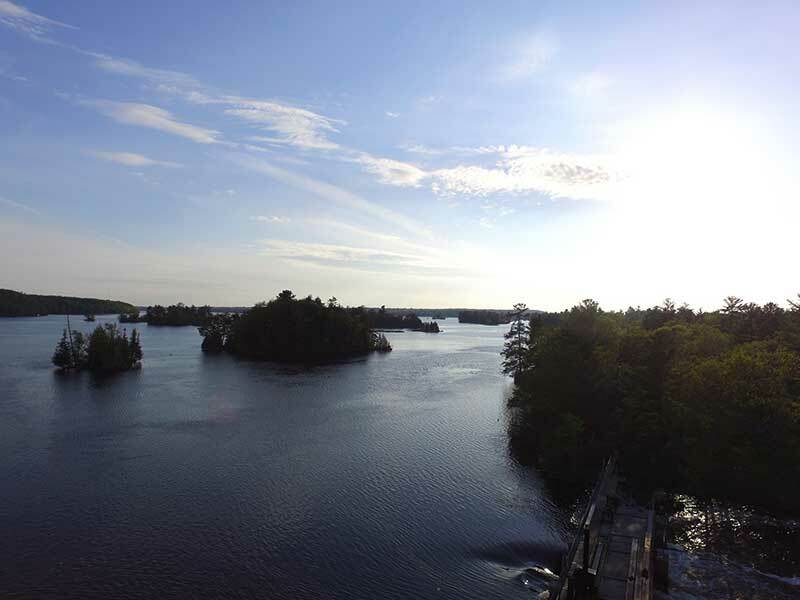 Just to give everyone a background of the area for those that don't know much about the Kawartha Lakes and the Trent-Severn waterway. The area features really large fresh water laters that are connected by a series of locks. 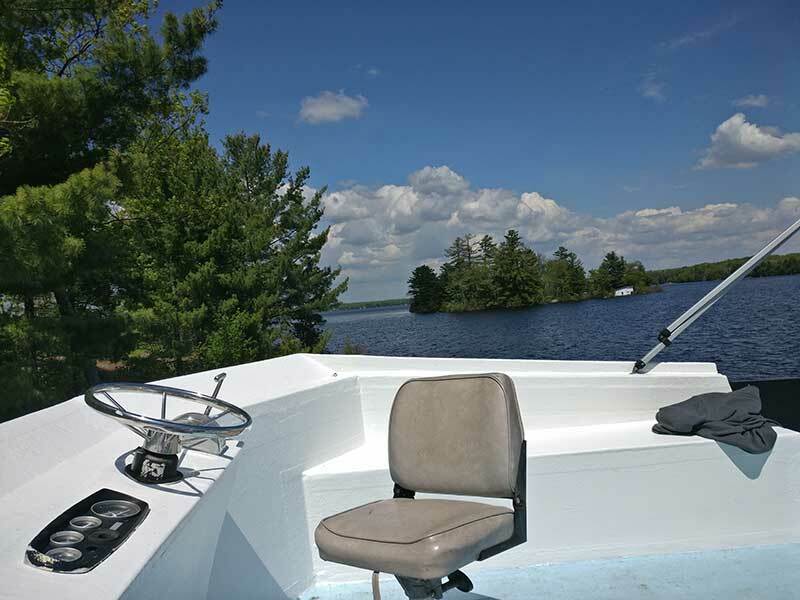 This area is pure cottage country with a few small towns located throughout. It is about a 2 hour drive from Toronto and the area sees about 1.5 million visitors every year. The boats are nice and they have around 20 houseboats including luxury models that can sleep 10+ people. They do excellent training for at least an hour and make sure you are comfortable operating the houseboat. They give you guides to take with you that you can always refer to and you can always call them if you need any help. 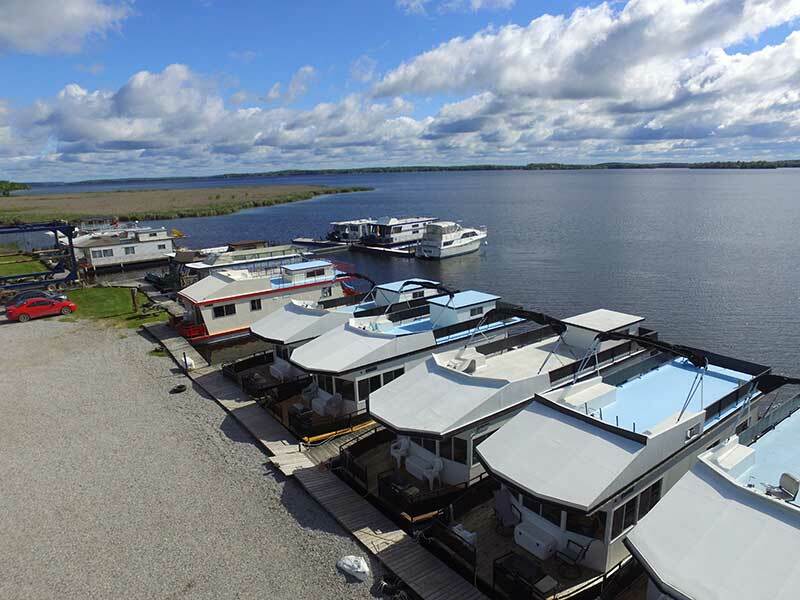 Read our review of Happy Days Houseboat Rentals here.